The free agent safety class was one of the more intriguing for those who follow contracts closely. Despite a league that’s becoming more pass-heavy by the minute, the market for free agent safeties hadn’t grown at the same rate as other positions around the NFL. Day 1 of free agency changed all of that though, with Landon Collins and Tyrann Mathieu both securing deals averaging $14 million a season. Still, Adrian Amos – PFF’s highest-graded free agent at the position a year ago (Earl Thomas didn’t qualify snap-wise) – had yet to come off the market. The chips fell this morning, however, as Amos was signed to a reasonable four-year deal worth $37 million. 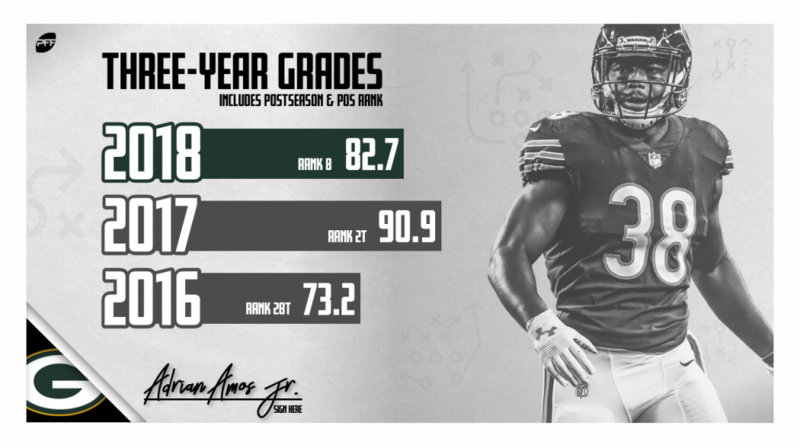 The public perception of Amos has never quite matched his lofty grades, so let’s dig into why PFF thinks this is the best value deal of free agency so far. The first one is a far more noticeable, and in some circles, a more coveted skill set. Picks, sacks, and pass breakups can change games. The second is a far more difficult skill to evaluate, yet has a ton of value itself. It’s difficult because the difference between one of the most sound safeties and one of the worst in the NFL can be as little as one play a game. That’s where PFF grading comes in though. Tracking every single play in the NFL, we can tell you that Amos is about as sound as it gets at the position in the NFL. The safety’s 12 combined picks and pass breakups over the past two seasons wouldn’t give the impression of an elite safety, but if I told you that he was downgraded at the third-lowest rate of any starting safety this past season and the seventh-lowest rate in 2017, that might change your mind. That’s more than enough of a sample size to conclude that it’s not a fluke. His nine percent missed tackle rate (15 misses on 162 attempts) over that span is the 10th-best figure among safeties with at least 100 solo tackles over the last two years, while just 22 of his 73 targets in coverage have resulted in a first down or a touchdown. Amos’ 27 coverage stops are the fifth most in the NFL, and that’s with missing a good chunk of 2017 with injury. Those are rock-solid numbers that put him among some elite company in the NFL safety hierarchy. As far as skillset goes, Amos does a lot of things around the line of scrimmage that are valuable in the modern NFL. He can play the run at a high level and even serve as the nickel or dime backer in Mike Pettine’s defense. If you are looking for a playmaking single high safety or someone to jump routes on the back end, look elsewhere. But the Packers were a nightmare in terms of assignments at the safety position last year. No safety on the roster had a coverage grade over 65.0. Amos has been one of the most consistent safeties in the NFL and looks like a building block for a budding secondary in Green Bay.